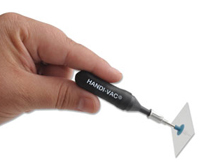 A scored line in a glass slide may be easily broken: use a Scribe and the Wafer Cleaving / Glass Breaking Pliers. 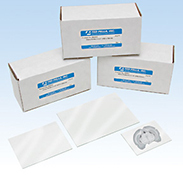 These large microscope slides are specially made for larger tissue sections, such as whole brain sections, to enable uninterrupted examination w/o loss of tissue. 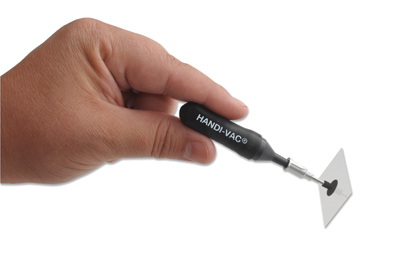 Standard thickness is 1.2mm, cut ends (not available with frosted ends). Made from optical grade soda lime glass. Sizes available are 4 x 3" up to 7 x 5". Packed as 36 slides slides per shrink-wrapped package. Pre-cleaned. Not available with frosted ends. Finest quality noncorrosive glass, with finely ground edge. Precleaned and packed vertically. Packed 72 slides per box, 2 boxes per package. No notable interference from UV absorption or reflection in the 250-350nm range (tested with 280nm). Large Plain Economy Slides, 3" x 2"
Made from clear soda lime corrosion resistant glass. 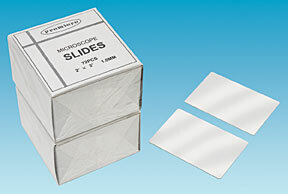 Precleaned slides with a size of 3" x 2" and a .039-.047" thickness (76.2 x 50.8mm and a 1-1.2mm thickness). Plain, ground edges and beveled corners, 144 slides per package. These slides have thin white frosted end for labeling. 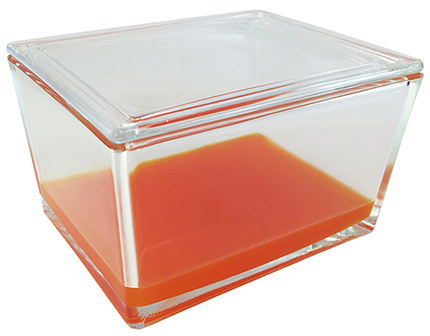 The unfrosted area is sized to accommodate the standard large section cut from a paraffin embedded tissue block from the large Super Mega and Super Mega Slim Base Molds (60 x 45mm). 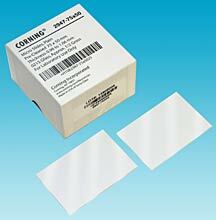 This coverglass is sized to match the working area of the HISTOBOND® + Super Mega Slide. 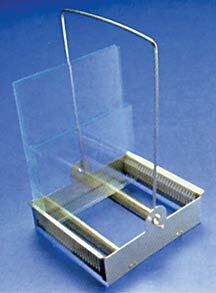 Large cover glass specially made for the large microscope slides. Thickness #2. (0.19-0.25mm). Made from optical grade borosilicate glass. Sizes available 3 x 3-1/4" up to 4-1/2 x 6-1/4". Packed as 36 cover glasses per shrink-wrapped package. Made of optical grade borosilicate glass. Made for the large microscope slides of 3" x 2" or larger. Simple hand actuated vacuum pump with 1/2" straight tip and 9.3mm (3/8") silicone cup to pick up coverslips, mica and Si chips. 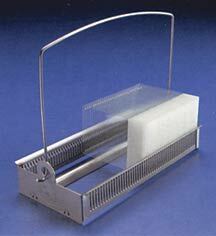 Stainless steel Slide Rack Adapter kit for auto stainer slide racks. 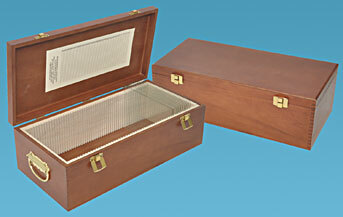 Allows the slide carrier rack for standard 1” x 3” slides to accommodate large slides for staining. The Slide Rack Adapter fits into the standard slide space like a slide. This companion adapter can be placed the appropriate distance to create a space for holding the large slide. 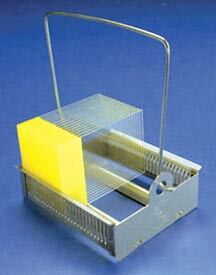 Staining Rack, for 30 Slides, 3"
Made of welded 303 stainless steel, rugged construction. Rack has a removable wire handle allowing the user to cover the staining dish. Holds 30  3" long slides. Dimensions: 3-1/2 x 3-7/8 x 1" H with a 4" high handle. 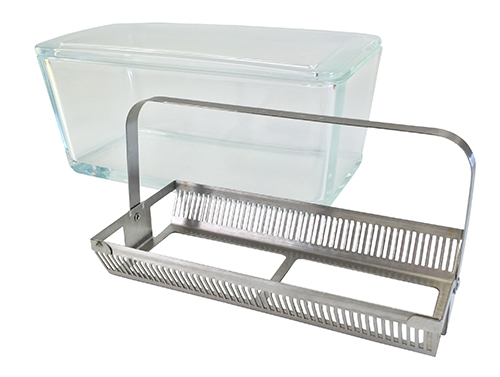 May be used in #21054 Staining Dish with Cover or #21210-64 Stainless Steel Staining Dish with Lid, see below. Wheaton® glass staining dish with cover, manufactured from soda lime glass. Holds rack 21082, above. Not suitable for temperatures below -15°C or above 80°C (5°/176°F). Dimensions: 130 x 100 x 70mm H (5-1/8" x 4" x 2-3/4" H). Staining Rack for 30 Slides, 4"
Made of welded 303 stainless steel, rugged construction. Rack has a removable wire handle allowing the user to cover the staining dish. Holds 30  4" long slides up to 5" tall. Two handles included to accommodate different slide heights. 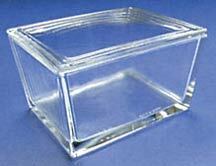 May be used in #21054 Glass Staining Dish with Cover or #21210-66 Stainless Steel Staining Dish with Lid for the 5" tall slides. Dimensions: 111 x 97 x 25mm H (4-3/8 x 3-13/16 x 1" H) with 101.6mm and 149mm high handles (4" and 5-7/8" H). 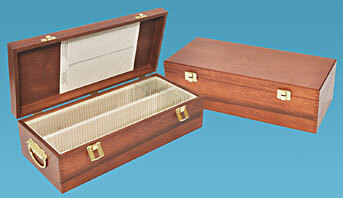 Staining Rack for 50 Slides, 3"
Rugged construction of 303 stainless steel. Rack has a removable wire handle making it possible to cover the staining dish. Holds 50 of 3" long slides. May be used in #21058 Glass Staining Dish with Cover (below) or #21210-44 Stainless Steel Staining Dish with Lid (below). 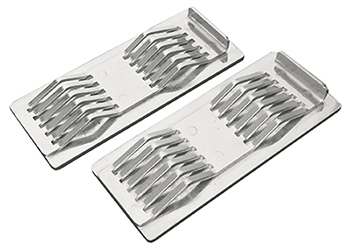 Slotted rack holds 50 microscope slides, sizes 3" x 1" (75 x 25mm) as well as 3" x 1-1/2" (75 x 38mm). The unit measures approximately 200 x 83 x 105mm (7.87" x 3.27" x 4.13") overall. Rack is made of non-tarnishable 304 stainless steel and is resistant to most staining solutions. The handle is permanently attached, but hinged to permit closure of dish and easy insertion and removal of the microscope slides. Dish and cover are made of soda lime glass. Approximate inside dimensions: 70 x 185 x 90mm (2.75" x 4.72" x 3.54"). Maximum liquid volume without rack is approximately 950 ml. These stainless steel staining dishes can be used to hold the staining rack #21089. Made of 18/8 stainless steel (AISI 304). Two sizes are available; for additional sizes go to Stainless Steel Containers with Lids. 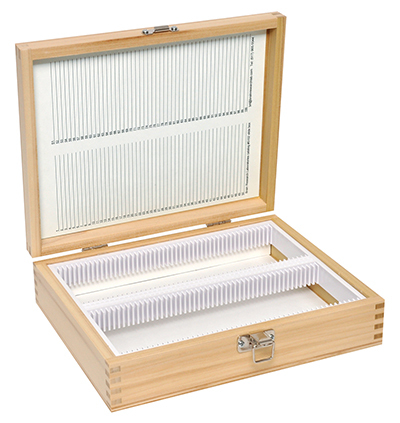 The Tall Slide Box made of sturdy ABS material is ideal for storage and transport of tall 3 x 2" (75 x 50mm) microscope slides. 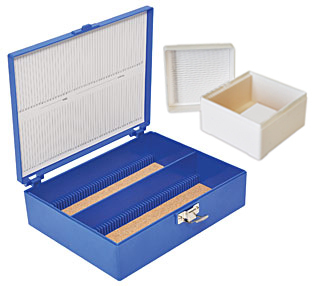 Available in a 100-slide and a 25-slide capacity box with grooved slots to prevent slide to slide contact. The base contains location numbers for convenient inventory, a cork liner in the 100-slide box and a foam liner in the 25-slide box. Lid interior contains a numbered index sheet for cataloging and identification. 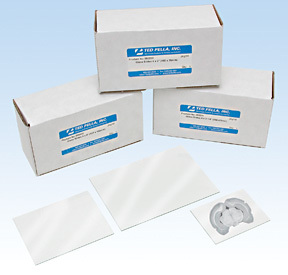 The deep design of the Tall Slide Box provides safe storage for the taller, non-standard microscope slides. 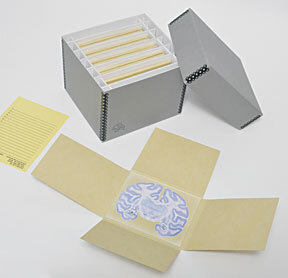 Made of heavy cardboard with a grey linen paper outside and white inside, die cut, for 25 large or standard slides. They will each hold up to 15 slides per box with 5 separate compartments that can store 3 slides each in separate four flap enclosures. Each slide is protected by the individual enclosures and easy access and removal can be done without damage. 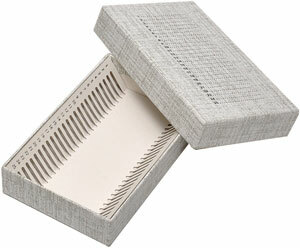 Boxes are secured on the corners with enameled metal strips. 38 x 75mm or 50 x 75mm (1-1/2 x 3" or 2 x 3").